air joe is proud to serve the Addison community! We are proud to be a part of this community, serving your heating and air conditioning needs: air joe is listed in many directories under titles such as : Addison Heating Contractors, Addison Heating, Addison Air Conditioning, Heating Repair, Air Conditioning Repair, Addison Heating and Cooling Contractors, Rooftop HVAC Repair, Ductless AC Systems, Boiler Repair and Addison Heating and Air Conditioning Contractors. We are here for you whether you need furnace or air conditioner repairs, heating and cooling estimates, equipment replacement or new installation of a furnace, air conditioner, heat pump, rooftop heating and cooling or comfort products to improve the air filtration for your home or business. 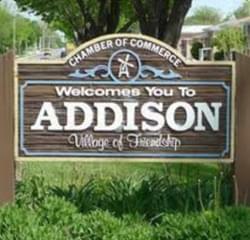 About Addison, IL - Happy to be your hometown Heating & Air Conditioning Contractor! Located approximately twenty miles northwest of metropolitan Chicago, the Village of Addison is one of DuPage County’s most attractive communities. Boasting a population of more than 36,000 residents, Addison is known for its friendly citizens, progressive economy, low property taxes, and beautiful seasonal climate that generates hot humid summers, cold snowy winters, and lovely mild weather during spring and fall. Situated along Salt Creek in northeastern DuPage County, Addison offers a world of opportunity for outdoor sports and recreation! The village is served by the award-winning Addison Park District, recipient of the Illinois Distinguished Accredited Agency Award for its excellence in programs and services to the community. Amenities include 25 community parks encompassing more than 284 acres of prime parkland, as well as two recreation centers, an outdoor Family Aquatic Center, state-of-the-art Fitness Club, year-round Links & Tees golfing facility, exceptional preschool program, and dynamic Senior Center. Located nearby to the village is the Salt Creek Greenway Trail, a 35-mile trailway for hikers and bikers that passes through marshes, parklands, and forest preserves as it winds its way through the communities of Addison, Wood Dale, Villa Park, Elmhurst, Oak Brook, and Oakbrook Terrace. Conveniently accessed via I-290, I-355, and U. S. Route 20, Addison is a great community for residents and visitors alike!